Make Higher Value Decisions. Improve Performance. Manage Risk. Are you making the best investment decisions in your critical infrastructure? Assets are aging and budgets are tight, yet expectations are higher than ever. Copperleaf™ Decision Analytics solutions empower businesses to make strategic investment decisions with confidence. A best practice in asset management that embodies the key principles of ISO 55000 and empowers businesses to make the highest value investment decisions. The ISO 55000 international standard describes best practices in asset management to help organizations realize the maximum value from their assets. Copperleaf AIPM is highly aligned with this standard and provides a collaborative and controlled environment for value-based decision making. Learn more about how AIPM supports ISO 55000. Realize the highest value for every dollar spent on your assets. Develop an investment plan that delivers the most value, fits in your budget, can be carried out with your available resources, meets your service level commitments, and helps your organization attain its strategic objectives. Deliver the highest value within real-world constraints. Manage investments from concept to execution. Stay on top of your changing business environment, understand variances between actual performance and your plan, and continuously adapt to drive the highest level of performance. Adopt a continuous planning approach to maintain the highest performance. Use analytics to forecast asset sustainment needs based on risk and economics. Create a long-term investment strategy that maximises business value while proactively managing risk. Develop asset plans to proactively manage risk. Copperleaf is at the forefront of asset management best practices, actively participating as a member of The Institute of Asset Management (IAM), the ISO 55000 standards committee, and other international standards bodies. These best practices are embodied in the Copperleaf AIPM methodology and in our C55 decision analytics solution which has been adopted by some of the largest, most respected organizations in the world. to optimize performance and manage risk. Copperleaf C55 is a unique decision analytics solution that leverages operational, financial and asset data to empower organizations like yours to make investment decisions that deliver the highest business value. Establish more efficient and effective processes to develop, approve, and manage investments through their full lifecycle. Provide a central repository for planning teams and stakeholders to collaborate on “one source of the truth” for all planning data. Establish an enterprise-wide value framework as the basis for risk-informed, value-based decision making. Confidently make trade-offs by understanding how risk and value change with time. Evaluate thousands of candidate investments and their alternatives to determine which projects to execute and when. Deliver the most value while respecting multiple constraints. Quickly adapt to changes in your business through continuous planning. Understand variances between actual performance and your plan, and quickly adapt to drive the highest level of performance. 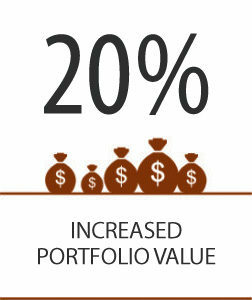 Model the impact an investment will have on the risk and condition of assets. Gain visibility into the residual risk that remains after investment projects complete—and understand the additional risk exposure when deferring projects. Use analytics to forecast the long-term sustainment needs of assets based on risk and economics. Create an investment strategy to proactively manage risk. 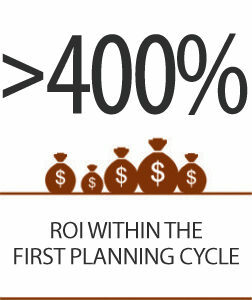 Smooth out funding & resource requirements to create a practical & realizable plan. Make decisions that generate the highest return to your business. Create an investment strategy that delivers the greatest value to your organization. Make investment decisions that maximize value, while proactively managing risk and continuously improving performance. Improve the efficiency and effectiveness of your planning processes and reduce the time and effort needed for justifications and approvals. Proactively manage risk in your aging infrastructure by understanding the long-term needs of your asset base. Create practical long-term investment plans that are continuously updated as new priorities emerge in the short-term. 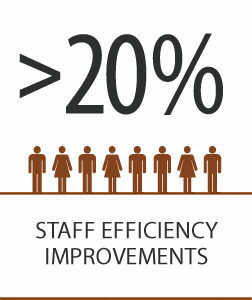 Improve business performance by rapidly responding to changing business environment. Track progress to plan, adapt quickly and update assumptions to continuously improve.